Our events are planned by team leaders and coordinators for months before the actual event weekend. Their time and focus is on marketing the event and finding / training volunteers to help manage the event. Our adoption events are made up of ten stations which adopters visit as part of the adoption process. Each of the stations are developed to hep the adopter find the right dog and to help the rescues find the right adopter. Event stations are managed by volunteers or professionals within the community. While we expect all focus to be on the adopters and dogs professionals volunteering their time at our stations may add their contact information and/or brochures to our adopter bags. Adoption counselors help pre-screen interested adopters, call references and interview potential adopters. 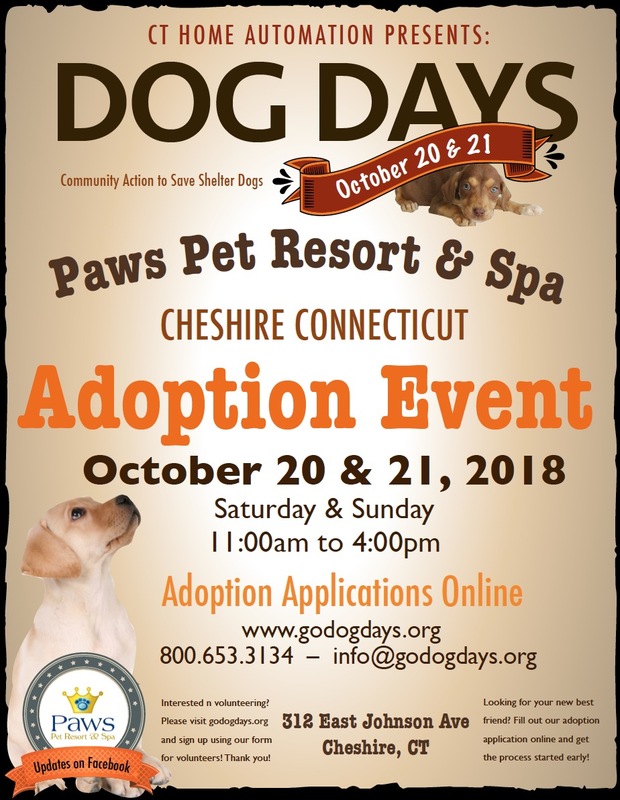 The adoption coordinator calls all new adopters to see how things are going and schedules home visits for out of state rescue dogs. General Store is no small task. Between donated food from restaurants, deli’s, grocery stores and the Food Team we make sure all DOG DAYS volunteers eat well! Site coordinator makes sure all event supplies are on site, in working order and assembled correctly. They also make sure wifi and printing stations are operational as well as food service areas, dumpsters, trailer parking and security. Site team also sets up perimeter fencing to keep dogs secure during the adoption event. During event site coordinator makes sure all items are inventoried before packing and low stock orders are placed. Transportation for trailers and supplies are managed by Site Coordinator. Managing incoming rescues involves many details and putting 80 dogs and puppies under one tent is no easy task. Our rescue coordinator will work with registered rescues to make sure their information is accurate and updated and coordinate any transport, grooming or vet needs they’ll have in the weeks leading up to the event. The Rescue Coordinator and the Ranger Coordinator work closely for each event. The volunteer coordinator keeps track of all of the people coming into the event who are not adopters. The volunteer coordinator greets the volunteers on Thursday, Friday, Saturday and Sunday. They also “check in” with volunteers during the event on general well being/need for breaks or drinks and they might be the “point person” if a volunteer does not know what to do. The volunteer coordinator also ensures that all volunteers are wearing proper lanyards with names displayed on the front and emergency contact information on the back. We start each event with a Blessing of the Animals and invite any religiously affiliated leader to give the blessing.